Culinary Genius at our Colne Kitchen Masterclass! Cookery fans were in for a treat last week at our latest Colne Kitchen Masterclass from the Neff professionals, where we invite chefs to come in and rustle up some wonderful recipes in one of our stunning kitchen showroom. As ever, our latest Masterclass welcomed a friendly group of cooking enthusiasts who were keen to get the latest tips and tricks from our Neff culinary expert. Our chef got busy in one of our fabulously appointed kitchens, rustling up a wide range of recipes, including the moreish Cheese and Pesto Tear ‘n’ Share Bread – and you’ll find the recipe for that just below. Seated around our Colne kitchen showroom, cookery fans got up close to the action and were invited to test out all of the finished dishes at the end of the evening – and rest assured, there was no shortage of volunteers for the job! Fabulous freebies at every Masterclass! Everyone who attends our Neff Kitchen Masterclass is entered into a prize draw to win a beautiful set of Neff induction pans worth £125. 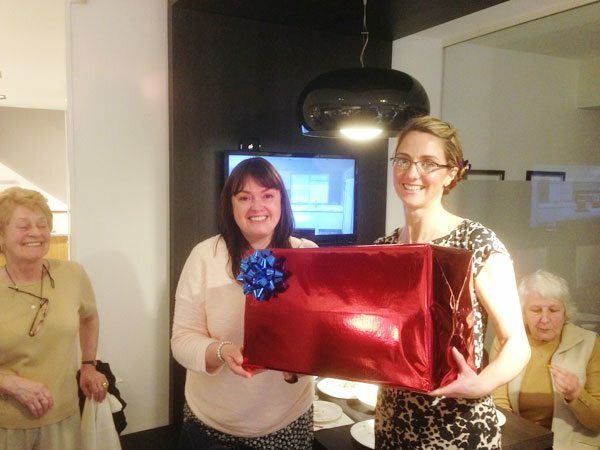 This month’s lucky winner was Donna McKiernan, pictured here with our designer Maxine Hutchinson. 1. Mix the flour, yeast, sugar, salt, butter and water in a bowl. Turn out on to a floured surface and knead well for 15 minutes. Cover in a bowl with a damp tea towel until doubled in size. 2. Knock back, roll out as if you were going to make a swiss roll, spread the pesto all over the dough, roll up, again, like a swiss roll, cut into 8 rolls (will look like Chelsea buns) and arrange on an oiled/buttered tray, cover with the wet tea towel and allow to double in size again. 3. When ready to bake, brush with extra virgin olive oil and sprinkle with sea salt (optional). Bake in the middle of the oven until golden and a hollow sound is heard when the bottom is tapped. 4. To make the pesto; Lightly toast the pinenuts in an oven, then make a paste in a mortar and pestle with the basil, salt, garlic and pinenuts, add the oil and grated cheese and mix. Our kitchen Masterclass will be back in our Colne showroom in a couple of months – in the meantime, you can always head over to our next cooking Masterclass, held at our Manchester kitchen showroom on Saturday, 17th May. Or, if you’d just like to have a look round at our beautiful kitchens, our helpful design staff are on hand seven days a week to answer your queries. What recipes would you love to see at our Neff Kitchen Masterclass? Share your ideas in the comments below or tweet @ModernKitchens!